Oatmeal Baking Powder Biscuits, easy, quick breads from Thyme for Cooking. if you don't have oatmeal you can substitute 1/2 cup chopped nuts or 1/3 cup more flour. Like most biscuits, these are best eaten warm from the oven, slathered with butter. Remember: oatmeal is good for you! milk to equal 1/2 cup; let stand 5 - 10 minutes; you are making sour milk. You should / may not use all of it; depending on whether you are using the oatmeal, flour or nuts and the humidity. Combine lemon juice and milk and set aside to sour. Put all dry ingredients into bowl. Add butter and cut in with pastry cutter, fork or 2 knives. The idea is to get the butter and flour mixed so that it looks like tiny pebbles or small peas. Add half the milk and stir lightly and briefly until just sort of combined. Scoop dough out onto a heavily floured surface - any clean counter top or table will work. Knead lightly 5 - 7 times - that is: press it together lightly, turn it over and do it again, folding it over on itself as you turn it. It's not going to look well mixed or smooth like bread dough. Rub flour on a rolling pin and lightly roll dough out to 3/4 inch (1.25 cm) thickness. Try to get it square shaped. Instead of the usual circles, cut the dough into 2 - 2.5 inch (5 - 6cm) squares. This makes all of the biscuits from one rolling. Less handling = lighter biscuits. 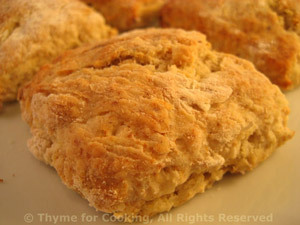 Put biscuits on a baking sheet and bake for 10 - 12 minutes in 450F (220C) oven or until lightly browned.